At Home Experiment 4: Stomp-Bottle Rockets — Explosions, Inc. The assembled launcher. You can modify the design as long as there is a straight path for the air to get from the bottle to the launch tube. Cut the PVC pipe into 1 four-foot piece, 2 two-foot pieces, and 2 one-foot pieces. Attach the four-foot piece to one of the two-foot pieces with the elbow joint, forming a large “L” shape. 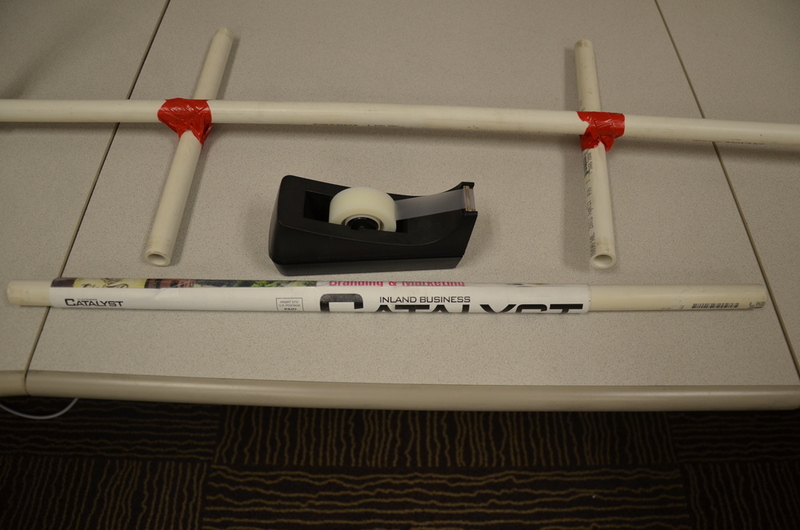 Attach the one-foot pieces to the four-foot piece with duct tape so the two-foot piece is standing upright. 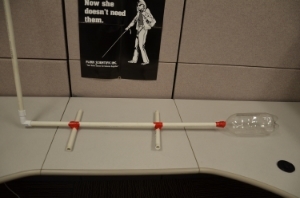 Using duct tape, attach the empty soda bottle to the open end of the four-foot piece of PVC. 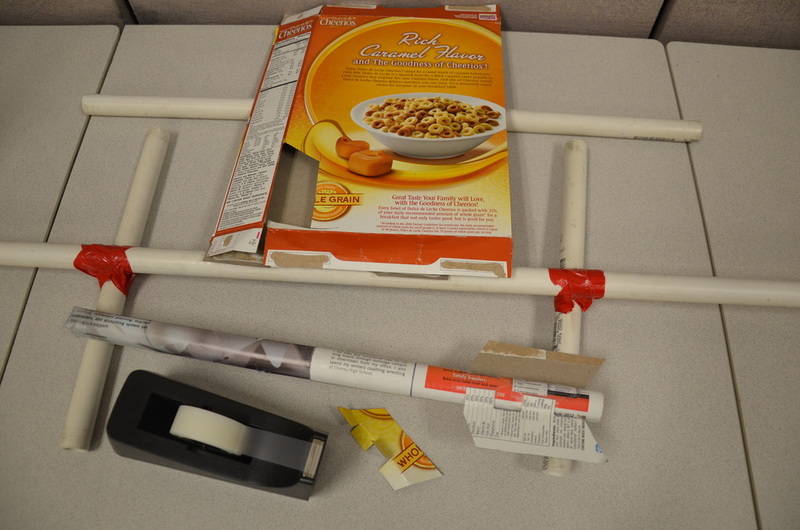 Make sure you don’t wrap the magazine page too tightly around the pvc pipe. To build the rocket we will use the left over two-foot piece of PVC as a frame. Take one or two pages of the glossy magazine and wrap it around the PVC pipe. 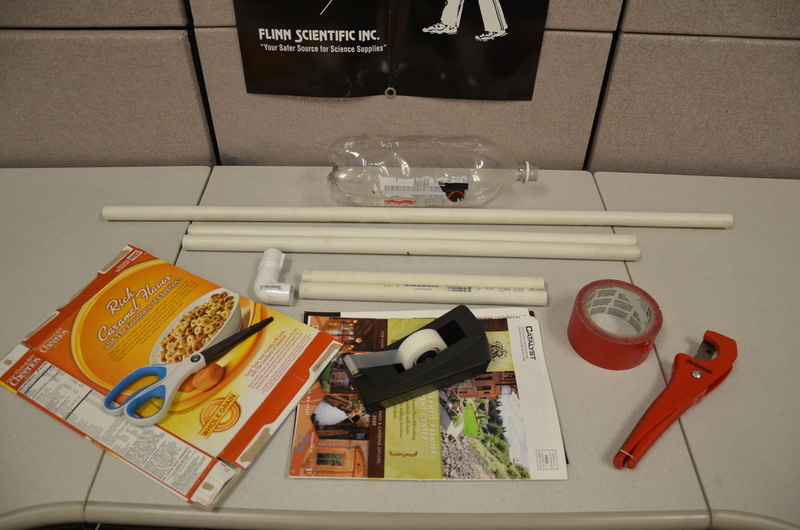 Attach the seams together with tape and slide the rocket body off of the PVC pipe. To launch your rocket slide it over the upright end of the launcher. Stomp on the soda bottle and watch your rocket fly into the air! To un-crush the bottle, simply blow air into the open end of the launcher. I suggest at least three fins but the number and shape of fins can be modified in many ways. circumstance, we are utilizing air pressure to propel the rocket. The volume of air in the soda bottle is forced into the PVC pipe when you stomp on it and, since the PVC pipe has less space for the air, it forces the rocket (which is capping the end of the PVC pipe) into the air. To be fair to Newton, his third law still applies. The air presses against the rocket, the rocket presses back, but the rockets relatively low mass means it is taking a trip to the skies.